One of the two pitcher plant genera in the United States. 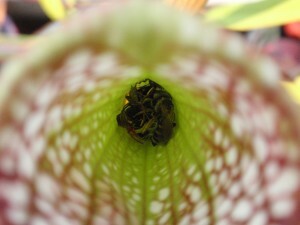 North American pitcher plants belong in the genus Sarracenia (pronounced “Sair-a-sin-E-a”). They can be grown year around in Idaho and are excellent wasp catchers! In fact, some pitchers may get so filled with wasps that the pitchers literally vibrate with the buzz of the insects! Plants produce very uniquely shaped flowers in the early spring. In the winter, plants require a dormancy period (read more about this in How do I take care of my plant?). No availability until spring 2016.